I've been trying a little Lectio Divina in my bible studies. I wonder how this bible guides the reader/user through it? Thank you for the information. I think your post has created two new buyers of the book. A friend and I both have it on our shopping lists. Thanks for stopping by. Please make sure to let me know what you think of it, when you receive it in January. I always appreciate my readers comments. I also think this is a Bible that I would like to purchase, but,I need a larger font and this is not mentioned, on any sites, for any of the newer Bibles. I purchased the ESV and NLT within the last year and both are hard on my eyes and I don't really enjoy reading them for that reason....plus, they don't have the Apocrypha. Personally, I don't care for the NAB and use NRSV a lot, as, that is what is used in our Churches in Canada. thanks for the comment. Yes I would definitely see how this NRSV edition would be attractive for you to purchase, particularly being up in Canada. I just wish they would give a little more info on it or some sample pages. Well, I guess we will have to stay tuned. Harper Catholic Bibles has an NRSV, XL Catholic Edition (which uses size 12 font) and is very easy to read. It is a reader's edition with no maps, etc. Most large print Bibles come in this sort of format. This Bible is available at local bookstores such as Borders and Barnes and Noble. Thank you Rolf. You are just one smart fellow, as, that is the one I use. I bought this version (very bare bones, though), the Christmas of 2007. I came across it browsing Claretian website for Christian Community Bible info. 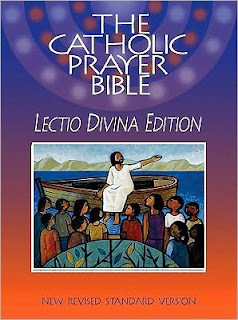 I have not found a distributor for the lectio divina bible - Amazon have not any copies in stock yet. They also let you see inside it. I wish the print was a bit bigger... otherwise it seems good. Thanks for the information Doreen. I guess you were referring to the print size of the lectio comments as the font size of the bible text is of course quite large. I bought a copy through Amazon at a very reasonable price and I think the book has been nicely done though NRSV is not my favourite translation and, as it acknowledges, it can only point towards lectio divina, which is something ultimately we have to do "ourselves" with the help of the Holy Spirit.